The first edition of this book constituted a comprehensive resource for students of higher education, faculty, higher education administrators and student affairs leaders engaging with multiculturalism and diverse populations on college campuses. It was one of the first texts to gather in a single volume the related theories, assessment methods, and environmental and application issues pertinent to the study and practice of multiculturalism, while also offering approaches to enhancing multicultural programming and culturally diverse campus environments. This second edition retains the structure and vision of the first, introducing readers to the key theories and models for understanding the complexity of the students they serve, and for reflecting on their own values and motivations. It provides an array of case studies, discussion questions, examples of best practice, and recommendations about resources for use in the classroom. This edition includes a new chapter on intersectionality, updates several chapters, presents a number of new cultural frameworks and updated best practices for creating an inclusive environment for marginalized groups, and expands the third section of the book on cultural competent practice. “The second edition sets out, successfully, to give ‘greater voice to students who are not part of the dominant cultures’. The format includes clear and succinct case studies that assist in revealing the experiences of each group of these students on college campuses. Authors include discussion questions at the end of their essays to assist in processing the material and to move the conversation forward. 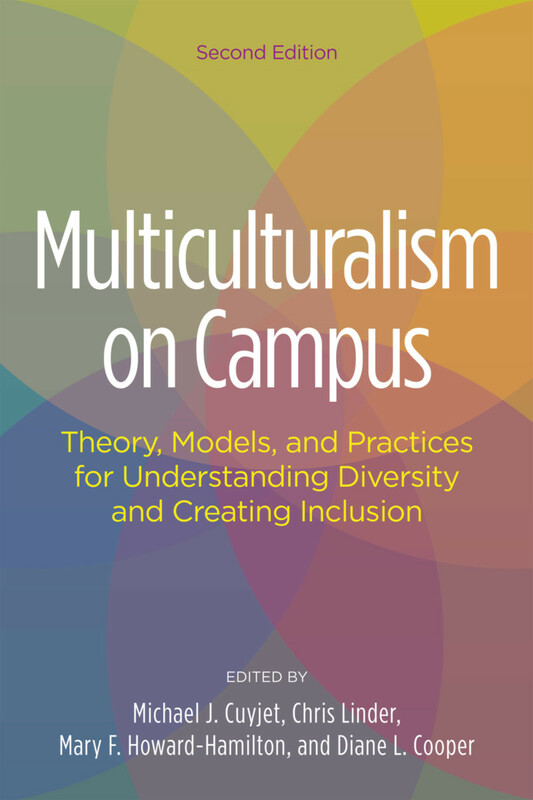 “This volume takes an intersectional approach to college student development by providing a thorough overview of the frameworks, applications, and assessments of multiculturalism. Across their chapters, the authors focus on student development. The bulk of their content is dedicated to racial and ethnic identity development. While a wide variety of student groups are discussed, the editors make a concerted effort to unify the distinct chapters by identifying similarities in different multicultural theories and the shared experiences of various groups of learners. Ultimately, because the book is so application-oriented (e.g., the chapters include resources like case studies, discussion questions, and implementation suggestions), it is particularly useful for student affairs professionals and practitioners. "This book advances our ability as educators to create inclusive campus communities by first providing information about critical issues and developmental processes for key college student populations, and then providing case studies and discussion questions. The focus on developing critical consciousness is especially powerful as it moves the conversation on diversity beyond mere inclusion to a more substantive dialogue on social justice, action, and identifying and challenging systemic privilege and racism on our college campuses." “This is an excellent resourceful book that faculty and administrators can use to enhance multiculturalism on college campuses." "In two words: impressively comprehensive. New professionals and seasoned administrators alike will find much that is useful in this book. The editors have assembled a dynamic constellation of scholars who offer rich insights into the texture and substance of multiculturalism on contemporary college campuses. Anyone who aspires to become a more culturally competent and responsive educator should read this text." "Multiculturalism on Campus is a tour de force. In this single volume noted scholars have created an excellent textbook for undergraduate and graduate students; a teaching tool for faculty; and, a comprehensive resource for all who strive for multiculturalism and social justice on college campuses." Michael J. Cuyjet is a Professor in the College of Education and Human Development at the University of Louisville, where he has been teaching and mentoring students in the College Student Personnel program since 1993. Prior to that, he served more than 20 years as a student affairs practitioner and an affiliate/adjunct assistant professor at Northern Illinois University and at the University of Maryland - College Park. During his 17 years at UofL he has also served as Associate Dean of the Graduate School and Acting Associate Provost for Student Life and Development. His research areas include underrepresented college student populations and competencies of student affairs new professionals. He is the editor and one of the authors of the 2006 book, African American Men in College, and a coauthor of the 2002 book, How Minority Students Experience College. He has edited two other books, including the 1997 publication, Helping African American Men Succeed in College; published more than twenty other journal articles or book chapters; and has made more than 100 presentations at national and regional conferences. Chris Linder currently holds a faculty position in College Student Affairs Administration and the Institute for Women’s Studies at the University of Georgia. She believes in centering the voices of historically minoritized people in higher education. One way in which she puts this value into practice is through research that fosters equitable campus environments, with an explicit focus on race and gender. Her research is informed by her work in a campus-based women’s center, where she supported survivors of sexual violence. Most recently, her research has focused on ways campus activists use their voices to elevate sexual violence as an important national issue. As a power-conscious educator, Chris also works to expose power in dominant narratives. Specifically, she examines the intersection of racism and sexual violence in historical and contemporary contexts. Mary F. Howard-Hamilton is a Professor of Higher Education at Indiana State University. She previously served as a higher education administrator for 15 years, working at five institutions, where her responsibilities variously included orientation, developmental education, judicial affairs, multicultural affairs, commuter life, and residence life. She taught courses in student affairs, higher education, and counseling at the University of Florida; and at Indiana University in Bloomington, Indiana where she was also Associate Dean for Graduate Studies in the School of Education. Her areas of expertise are multicultural issues in higher education, student development theories, feminist theory and therapy, and consultation. She has published over 75 articles and book chapters, and co-authored or co-edited five books. Diane L. Cooper is a Professor of College Student Affairs Administration in the Department of Counseling and Human Development Services at The University of Georgia. She served for eight years as a student affairs practitioner at the University of North Carolina at Greensboro before joining the faculty in Student Development at Appalachian State University from 1992-1995. Dr. Cooper served for 6 years as the Editor for the College Student Affairs Journal and on the editorial board for the Journal of College Student Development. She is the co-author of several books including Identity development of diverse populations: Implications for teaching and practice in higher education and Learning through supervised practice in student affairs. Her research interests are in multiple identity development, program design and assessment, legal and ethical issues in student affairs practice, and professional issues related to underrepresented groups in higher education.